On the morning the Camp Fire started, Robert Talk was on his way back from a job in the next town. He got home just in time to run in to his mobile home and grab the important stuff. He remembers having to drive past walls of flames just to get out of Paradise. Now Talk is staying at Wallywood, the informal name for the informal encampment that has popped up outside of Wal-Mart. Wallywood is home to at least a hundred people, staying in RVs, in tents, or on cots in carport pop-ups, all trying to weather first the smoke and now the rainstorms that have besieged Chico, CA. Talk tells me he has been trying to help the Red Cross distinguish between “fire victims”, who the Red Cross is delivering donations and service to, and “homeless people”, who he says have been taking advantage of the generosity of people donating. But in reality, everyone in the camp has found themselves in desperate circumstances, lacking housing as well as basic necessities like soap, dry clothing, tampons. A mother dug through piles of donated shoes looking for matches that would fit the bare feet of her young children while old men sorted through donated toiletries looking for razors they could use to shave. Butte County has long faced a housing crisis, with a vacancy rate between 1-3%. In the aftermath of the Camp Fire, which consumed more than 12,000 structures, available – and especially affordable – housing will be even more scarce. After last years fires scorched Sonoma County, residents faced steep rent hikes and many were forced to relocate. With the failure of Prop 10, which would have allowed local governments to pass rent control regulation, Chico’s housing crisis will likely be exacerbated. Though Robert Talk is antagonistic towards those at the camp he sees as freeloaders, he himself spent decades living on the streets in Butte County and working as a carny. On the Monday afternoon just after Thanksgiving activists with the North Valley Mutual Aid project gathered at Wallywood for a meeting that the Red Cross had called, supposedly to talk about what would be offered for residents of the camp who had no other place to go. They talked amongst themselves and with residents while some drifted into the donations tents to help organize the unruly stacks of toothbrushes or piles of sweaters, or to roast hot-dogs for the campers. Dan Everheart, a volunteer for North Valley Mutual Aid, sits in his wheelchair on the one paved path through Wallywood and wonders aloud if the Red Cross will show for this meeting they called. While the Red Cross is widely known for responding to disasters and supporting relief efforts, what that work looks like on the ground is often pretty abysmal. A significant percentage of the money donated to the Red Cross is spent on fundraising, $18 for ever $100 raised according to Charity Watch, and beyond that there is little accountability for what money is actually spent on. Johnathan M. Katz also wrote a detailed report on the Red Cross and how the organization failed to deliver after raising nearly $500 million for victims of the 2010 earthquake in Haiti, only a third of which had been spent or committed to rebuilding three years later. Propublica and NPR also did a report on the Red Cross and found that during hurricanes Isaac and Sandy the disaster organization had diverted emergency supply vehicles meant to deliver much-needed relief and instead instructed drivers to drive empty trucks around to keep up appearances. Organizers on the ground in Chico had observed appalling behavior from the Red Cross in its response to the Camp Fire, turning away unhoused people from shelter and trying to prevent citizens from donating to encampments they claimed “homeless people” were staying in. At Wallywood private security as well as Red Cross volunteers were telling people who showed up with boxes of necessities not to donate them, or to go to one of the Red Cross run donation sites, rather than giving the supplies directly to the hundred people camping outdoors. “It seems to me that from early on they’ve tried to winnow the worthy from the unworthy,” Everheart said. No one seemed surprised when the Red Cross failed to show up for the meeting they themselves had called. Last year’s Sonoma County fires were the most destructive on record, killing 44 people and doing $14.5 billion in property damages and fire suppression costs. This November’s Camp Fire that devastated Butte County set the record again, with at least 88 deaths, though the numbers are still rising, and over 18,000 structures burned. Thousands of people have been made homeless by this fire. But at least 1,983 people were already homeless in Butte County before the recent disaster, according to the 2017 Point-In-Time count, which is notorious for undercounting homeless people. That number marked a 76% increase in the number of homeless people in Butte County since the 2015 count, and numbers seem to have continued to skyrocket as rents have increased dramatically and people have been displaced. Rents have also skyrocketed in the area, both before the fires and in their aftermath. Rents in Chico are higher than 92% of other cities rents according to the U.S. Department of Housing and Urban Development (HUD), and they just keep rising. Across town from the Wallywood encampment Tory Lemilliere is worried about the new folks showing up to the encampment she helped found with several other homeless elder women. She says adjusting capacity to welcome the new folks is a challenge, as not everyone respects the quiet hours and some people aren’t as willing to share when donations are dropped off. Nonetheless she knows everyone needs somewhere to be. Tory started the encampment, know as the Triangle, because there weren’t enough shelter beds for all the homeless people living in Chico. She says trying to get a safe indoor place to stay is a huge challenge. She doesn’t think it’s fair that donations are being redirected away from homeless people and kept only for fire survivors. 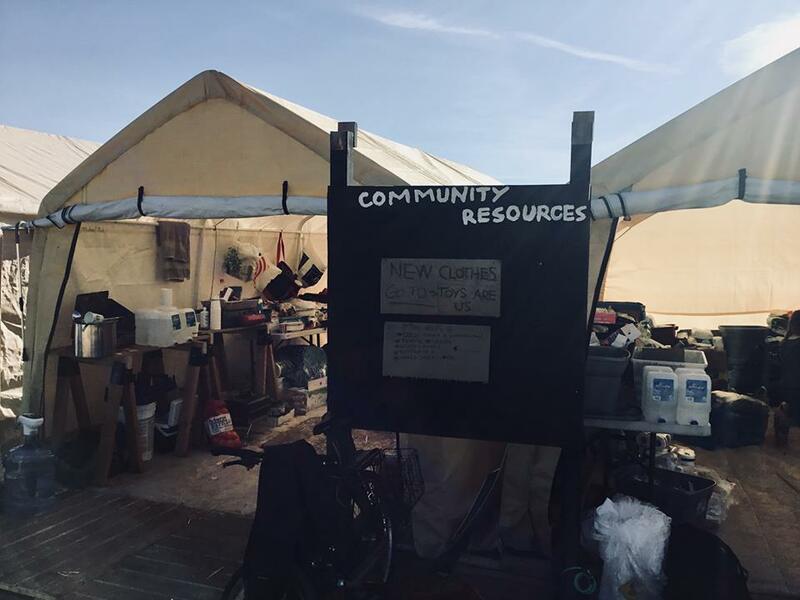 Since the first the North Valley Mutual Aid organization has worked to bring pallets and supplies to this and other encampments that are not being reached by more official relief groups. 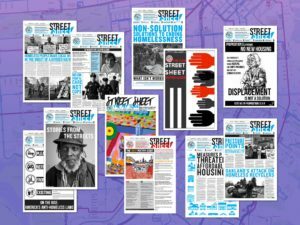 Many staying at the Triangle expressed fear of trying to stay at traditional shelters. The shelters are extremely overcrowded, the hours are restrictive, people can be kicked out for using any kind of substances, and there was an outbreak of norovirus soon after the fires. Many find having the privacy of a tent and the freedom to come and go as they please preferable to the restrictive shelters. The fate of the unofficial encampments that have started or swelled to meet the tremendous need since the fires is yet to be determined. Every day private security guards working for Wal-Mart do incessant patrols through the camp, collecting information about campers and counting the people present. They have put up massive signs by the camp instructing those coming to help not to bring donations or supplies to the camper, and some campers say security have even let themselves into people’s tents. At the same time city officials have said camps like the Triangle will no longer be tolerated. On November 30th fairground shelters opened in Chico, and security have been escalating their harassment of campers to get them to move to the sanctioned camps, which are patrolled by police and National Guard. That day a large fence was constructed around the sides of the Wollywood encampment so that its residents are no longer visible to shoppers passing by. North Valley Mutual Aid is supporting campers in a push to set up a people-run permanent encampment that would be free from policing and harassment. In the meantime the need for support is constant, and volunteers are working hard to provide food, warm clothing, and shelter to those suddenly and not-so-suddenly without it.